Larisa Andreea Iordache was born on 19 June 1996 in Bucharest, Romania and still makes her home there today. Iordache claims that gymnastics chose her rather than the other way around, and it was when she was rollerblading that she drew the attention of a gymnastics coach who was impressed by her energy and speed. Though Iordache performed well at the European Championships, it wasn't until later in 2010 that she truly excelled, earning resounding success with a first place in the all-around competition at the Romanian Championships, beating the second-place getter by a large margin. In October of that same year, Iordache again beat out her competition at the Schiltigheim International held in Schiltigheim, France to earn first place in the all-around final. Her event final scores earned her a second place on vault, the first place on uneven bars and a first on balance beam and on the floor. The following year (2011) Iordache's success continued when she was placed first on floor, balance beam and on uneven bars in the event finals at the Gym Festival held in June at Trnava, Slovakia, competing against 28 of her peers from nine countries. Later that month the Romanian team won first place when they competed against Great Britain at Lilleshall, Shropshire, England. 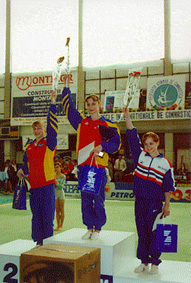 The Romanian team was so strong that it beat Great Britain in every event except the uneven bars. With a score of nearly 5 points more than her British counterpart, Iordache took the all-around title. The following month Iordache traveled to Trabzon, Turkey to compete in the European Youth Summer Olympic Festival, where she as part of the Romanian team finished in second place. She personally took the all-around final title as well as winning first place in the event finals for balance beam and floor. Iordache managed to place second on vault and uneven bars. In her first year as a senior Iordache competed in a number of competitions throughout 2012. After a less than stellar beginning to the year having managed only a third in the all-around at the American Cup in New York City, and a fourth place in the uneven bars at the Artistic Gymnastics World Cup hosted by Doha, Qatar, April saw her help her Romanian teammates win the team competition against France in Cholet, France. At the same competition, Iordache once again took the all-around title. The Romanian team and Iordache both repeated their successes when they went up against the United Kingdom and Germany in an international meet held in Ulm, Germany. Sadly, for Iordache she developed plantar fasciitis prior to the Summer Olympics held in London, England in 2012 bringing into doubt her ability to represent Romania in all four events. Despite this, she did, in fact, compete in all four events but failed to win any of them. Her efforts did aid the team to place third in the all-around, however. Throughout the following years, Iordache managed to bring her total medal wins to no less than 20 (to date), winning 7 gold, 7 silver, and 6 bronze both as an individual competitor and as part of the Romanian gymnastics team competing at a variety of internationally renowned events. Due to an ankle injury and school exams she has had to miss out on a number of events which may have raised the total number of medal wins even higher. Recovery from a torn Achilles tendon that occurred in 2017 has been slow and has made Iordache question the future of her competing in artistic gymnastics events. To date, she has undergone surgery three times to correct the problem and has been quoted as saying that the chances of her returning to competitive artistic gymnastics are about 50%. Nadia Comaneci - romanian gymnastics legend. You can read about the men team too.